Ed Joyce struck 151 not out, his second century in the match, to help Sussex beat Warwickshire at Edgbaston. Having resumed on 273-2, needing just 57 more runs for victory, the visitors lost Rory Hamilton-Brown (54) with the morning less than four overs old. But Joyce combined with Matt Machan (26 not out) to knock off the remaining runs and complete a seven-wicket win. The result came in spite of England batsman Ian Bell's 189 not out in Warwickshire's second innings. 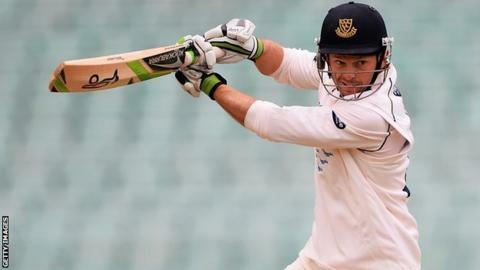 Bell, whose century was the 46th of his first-class career and first for the Bears in almost two years, was part of the England Test side beaten 5-0 by Australia in the winter Ashes series. But the 32-year-old's knock was overshadowed by Joyce's efforts in this match, with the Irishman hitting the 18th boundary of his 237-ball innings to seal victory less than an hour into the final day and, in the process, bring up his 150. Jeetan Patel (2-110) had earlier dismissed Hamilton-Brown, caught by Jonathan Trott, to halt Sussex's progress, but they would not be denied a first Championship win at Edgbaston in 32 years. "A first Championship victory for 32 years at Edgbaston for Sussex, who lead the table after successive wins. "Cricket manager Mark Robinson has never won here as a coach or a player, but he missed the victory reportedly attending an interview with the ECB at Lord's. "Ed Joyce led the way with magnificent centuries in each innings - the first time he has achieved that feat - and fittingly he scored the winning runs, bringing up his 150 in the process. "Rory Hamilton-Brown said after the game that Joyce's batting is 'from a different planet' and that 'the captain leading from the front is a special thing for the dressing room'. "Spare a thought though for Ian Bell - his 189 not out showed why he is regarded as one of the best players in the world, but his decision to bat first on Sunday ultimately proved very costly. "With Chris Nash and Luke Wright still to return to the side, the prospects for Sussex look very encouraging, and they now have a break over Easter before Somerset visit Hove."